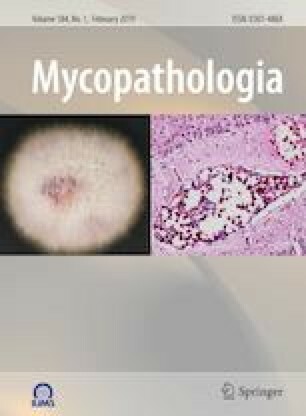 To characterize the clinical and mycological features of favus of scrotum due to Trichophyton rubrum. A single-site prospective study was carried out in an outpatient dermatology clinic. Microscopic examination and fungal culture were done using skin scrapings. Scales on the scrotum were stained with PAS and visualized by microscopy, including in vivo reflectance confocal microscopy (RCM). Two strains were analyzed by RAPD typing. Scutular lesions were fixed for scanning electron microscopy (SEM) and transmission electron microscopy (TEM). Cultures of the scale from the scrotum and/or groin in all patients showed a growth of T. rubrum. T. rubrum strains from scrotum and groins in one patient were demonstrated as the same strain by RAPD typing. The average age of patients was 34.1 ± 12.78 years. The mean course was 8.2 ± 5.07 days. All the patients received only topical treatment for 2 weeks without recurrence. Direct smear, calcofluor-white staining and in vivo RCM study of the scrotal favus in patients showed a massive number of septate branching hyphae, while fewer septate hyphae in scales in the groin. Abundant hyphae were found only in the outer layer of the stratum corneum of the scrotum under SEM and TEM with intact bilateral cell walls, and normal nucleus, liposomes and reticulum. Few distorted hyphae structures, cell wall degeneration, degenerated cytoplasm and the autophagy phenomenon could be seen in scales from groin under TEM. Scrotal favus due to T. rubrum is still a true infection, which most often occurred in immunocompetent patients. The online version of this article ( https://doi.org/10.1007/s11046-019-00337-8) contains supplementary material, which is available to authorized users. We would like to thank Dr. Roderick Hay for his helpful comments and advice in preparing this manuscript. We would like thank Jun-Ying Li, Nian-Hang Rong for their help of electronic microscopy examination. This work was supported by Hangzhou Science and Technology Bureau (No. 20100733Q09), the Zhejiang Provincial Natural Science Foundation of China (No. LY15C070001), and the Science Technology Department of Zhejiang Province (No. 2013C33093). The study was approved by the hospital ethical committee. Informed consent was obtained for the study of medical records.